Oil Can Henry’s is an Oregon-based provider of vehicle maintenance with more than 100 shops located throughout the Pacific Northwest. The chain is widely known for its 20-point full-service oil change – a service performed while customers wait in their cars. To better connect with this captive audience during their service, the company installed digital signage displays in maintenance bays at locations across all of its key markets. Each service bay now includes a touch-based digital signage display comprised of an ELO 42-inch interactive touchscreen connected to a BrightSign XD1132 digital signage media player. The displays are mounted just outside the driver side window within direct view of the customer. Cameras are mounted under the car and above the hood, giving customers a close-up, real-time view of the maintenance being performed on their vehicles. The remaining screen area, when not touch-activated, shows seasonal service reminders. The XD1132’s two video decoders output a combination of video and point-of-sale motion content. To bypass the need for additional video decoders, IP cameras output MJPEG feeds at 15 frames per second – a high enough frame rate that the feeds appear very close to true full-motion live video, showcasing the true flexibility of the BrightSign media player. At various points throughout the visit, the service technician utilizes the touchscreen to discuss the vehicle’s service history with the customer. The integration includes a POS feed displaying maintenance history that allows the technician to select the applicable service-based content segment. 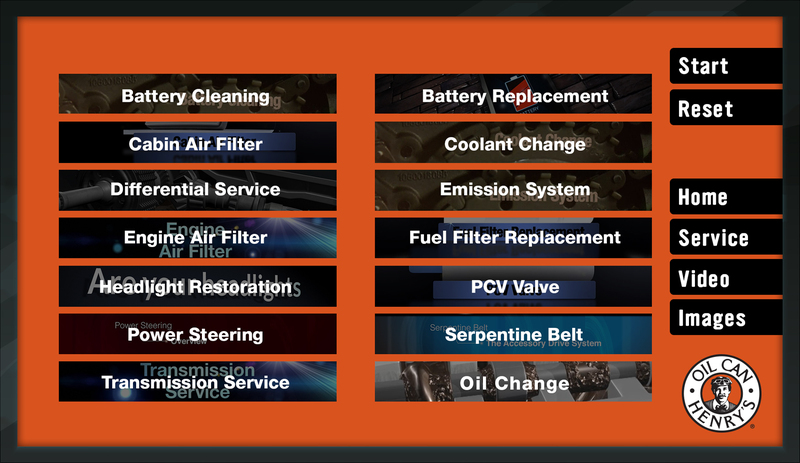 These 1-3 minute video segments visually explain the benefits of having these services performed on the vehicle. The customer can be shown any number of these videos in succession based on their needs. While the segments are playing, the technician can resume his work and return later to inquire about adding these recommended services. All of these POS feeds, video segments, camera feeds and touch-screen content components are driven by a single BrightSign media player, and the entire network of media players is hosted on the BrightSign Network. This digital signage network can support additional future uses, including Bluetooth audio for portable speakers placed in the vehicle during service, along with tablet support of assets being stored and accessed on the media player. Additionally, the media player can be used to distribute content for corporate training and employee communication during off-hours. This digital integration was implemented in a subset of Oil Can Henry’s locations to assess its impact on bottom-line financial growth for the company. The test pilot locations reported average total ticket service increases of nearly $22 per vehicle, compared to existing locations that haven’t yet incorporated this solution - this represents an overall increase of more than 20 percent. This successful pilot justifies the business economics for further site implementation.